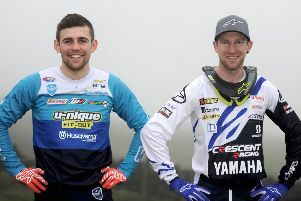 Local motocross riders Charlie Irwin and Matthew Beattie went to Spain over the half-term holidays to train with ex-British champion and Grand Prix star Gordon Crockard ahead of the forthcoming Pirelli Masters and British championships. It was hard but rewarding work for the boys and they both enjoyed the experience. Both needed hard-pack training to increase their fitness and make sure the bikes were set up for the long season ahead. Charlie said: “I loved the tracks and learnt a lot over the 10 days and now I can’t wait for my first race at Culham MX Park for round one of the Pirelli Masters in a couple of weeks.